While chasing warblers at Lafitte's Cove this Spring, I found some newly arrived Summer Tanagers. They also winter in Central and South America and make the perilous migratory journey to the southern US to breed and raise their babies. That includes Texas but from what I read, they nest and feed high in treetops. That fact alone makes seeing them out in the open a big thrill. 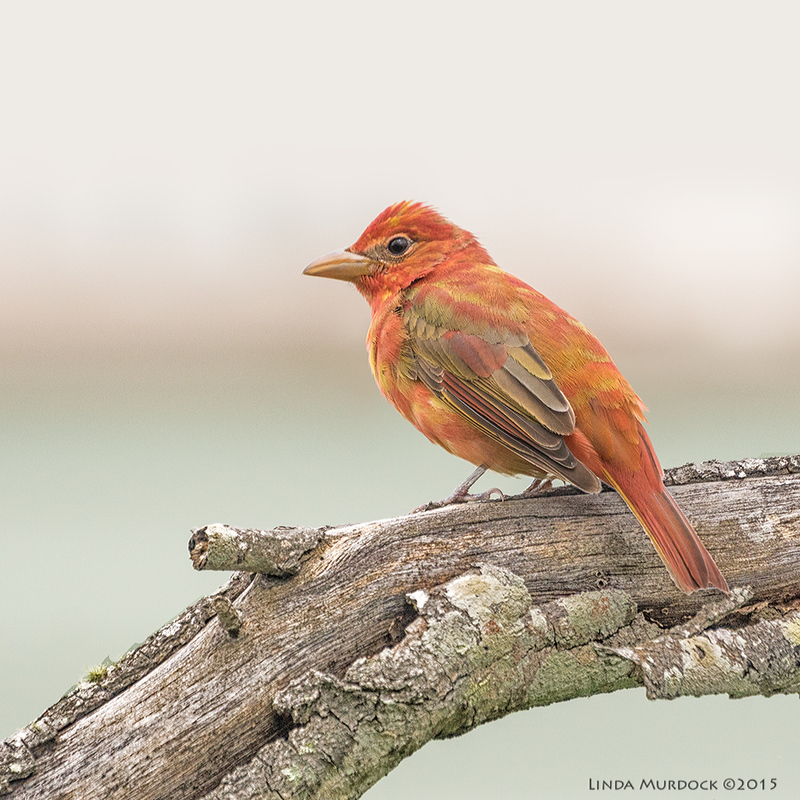 The adult male Summer Tanager is the only totally bright red songbird. Their wings are dark red, but they lack the black face of the Cardinal or black wings of the Scarlet Tanager. 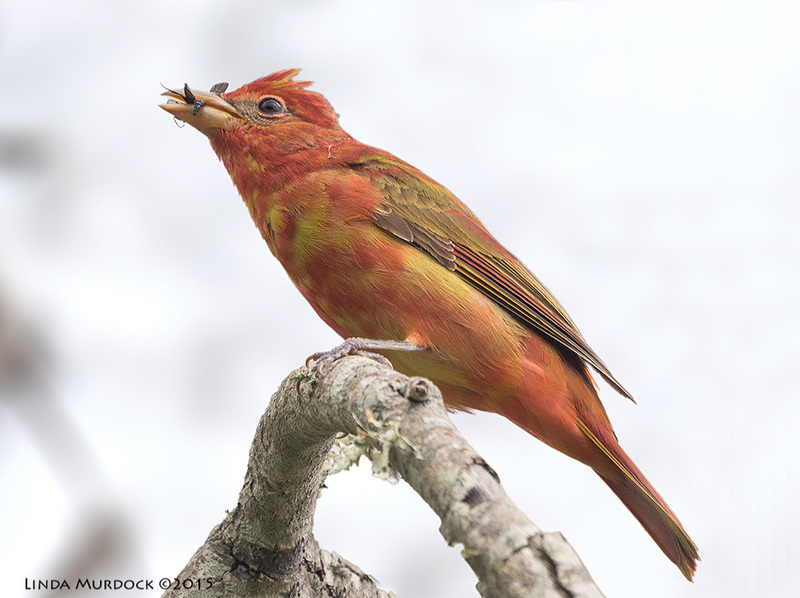 There is a Hepatic Tanager that has gray cheeks and a darker bill, but occurs in the US southwest. I never got a clear photo of the adult male, so I just borrowed this one from Bill Maroldo. He has a kazillion photos of all the birds we see; this was taken at Quintana Neotropical Sanctuary a few years ago. Just as a reminder, if you see a flash of red, don't automatically write it off as the familiar Cardinal. Note: Bill has updated his Flickr account with a lot of new photos in case you want to drool over his great images. The females are mustard yellow, with a greenish back. We found a leafless tree at Lafitte's Cove back in April with several Summer Tanagers that were willing to pose for us. I especially liked the lichens; they add a lot of interest to the standard "bird-on-a-stick" photo. Female or young male Summer Tanager? So, we know the males are red and the females are yellow. 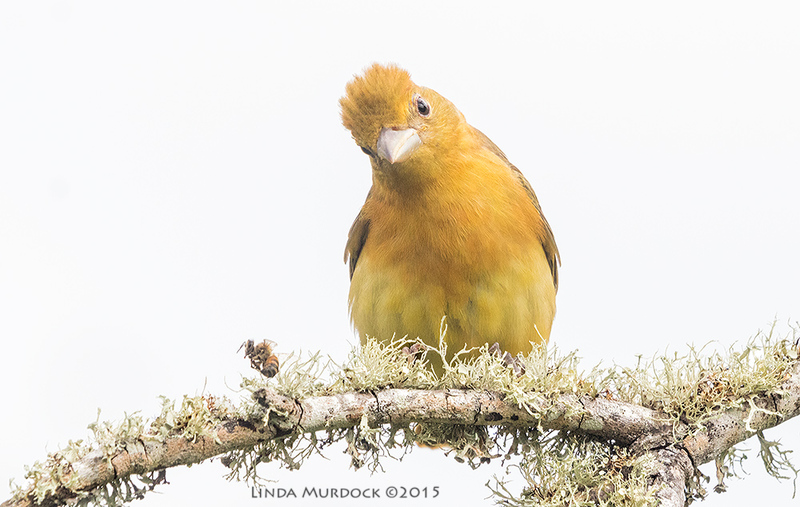 The tricky part is that the immature males start out yellow and gradually acquire the red plumage. This above could be a female.... or is it a young male starting his big-boy feathers? This one is more straightforward as he had most of his red feathers; one birder on Facebook calls these "marmalade" tanagers. Others refer to this plumage as "first year males". What I found so fascinating when researching this birds is.... they eat bees and wasps. They catch them and then beat them senseless against a branch until they are dead. Then, they rub them along the branch to remove the stinger before eating. 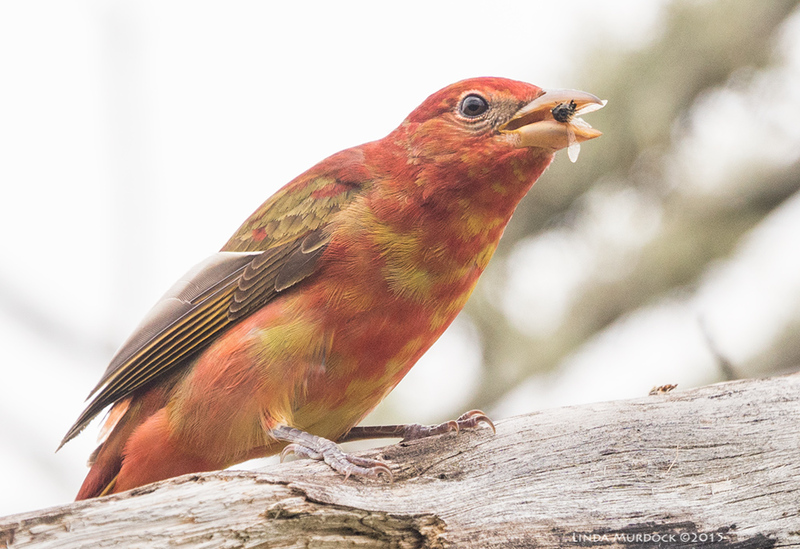 Summer Tanagers will also eat the larvae after getting rid of the adults when they find a nest. This young male has what I think is a bee. I didn't see him catch it, but you would think the bees would learn to avoid these birds. I noticed he put it down and then picked it up when it didn't fly away. "Putting it down" evidently involved more force than I could see as it did not move at all. They will also eat spiders and other terrestrial invertebrates as well as fruits and berries. I hear they love mulberries. Tanagers will nest and raise young in mixed woodlands. Their nests are built only by the female and are usually 10-35 feet above ground on a horizontal branch away from the trunk. Seeing one at that distance would be difficult, and getting a photo next to impossible. After mating and nest building, she lays 3-4 eggs and incubates them alone. Some males bring food to the female, but all bring food the day the eggs hatch. How they know The Day is one of those mysterious avian things. The male will help feed the new helpless nestlings. After 10 days, the still-flightless chicks leave the nest and hide among the foliage, and beg to be fed. Both parents feed them for the next 3 weeks. And sometimes they raise two broods. They will leave the breeding grounds in September and October and migrate mostly at night to Central America and the northern part of South America. The ones from the Eastern US fly over the Gulf of Mexico; the ones in the West fly overland. I am exhausted just thinking about it. Aren't you amazed? Let me know what you think in the comments below.